NF in F jacket. Signed by the Author SIGNED-Octavo. Black boards quarterbound in a black backstrip with shiny gilt lettering on the spine. Very slight bump at the tail of the spine. White endpapers. Signed by the author on the title page in black pen. Binding is straight and tight. Small brown spot on the outside edge of the textblock-about a fifth the size of a dime-pages are otherwise all clean, white, and crisp. 384 pages. Dust Jacket has no discernable flaws. Very nice copy. 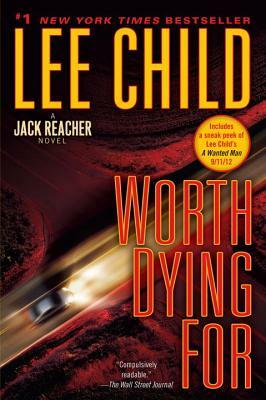 Fifteenth book in the Jack Reacher series. Fine in Fine jacket. 0385344317 First Print. First edition. Signed by the author on the title page. NOT inscribed, clipped or otherwise marked. Dust jacket in protective cover and shipped in a box. Complete # line 10987654321. Fine in Fine jacket. Book. Signed by Author(s) Mylar protected. Fine in fine dust jacket. 2010. Hardback. Fine first edition first print in fine dust jacket protected with Mylar cover. Very good in very good dust jacket. Signed by author. Glued binding. Paper over boards. With dust jacket. 384 p. Jack Reacher Novels (Hardcover). Audience: General/trade. VG+/VG+ First edition with complete number line. Flat signed by author on title page. Very Good. Signed First Edition with full number line. Clean crisp pages with no marks or inscriptions. Dust jacket has light creases to top and bottom edges. Light shelf wear. Fine in fine jacket. A Jack Reacher novel. Book is like new. Tight binding, sharp corners, clear and crisp paging with no markings, writing, or soiling. Jacket shows very, very light rubbing on back, otherwise pristine. First edition so stated. Number line complete. Not price clipped. Signed by the author in person, signature only. An excellent collectible and in gift-giving condition. VG: in very good condition with dust jacket. Slight spine lean. 240mm x 150mm (9" x 6"). 410pp. Signed by author on title page. Fine in Fine jacket. Signed A 384 page Jack Reacher thriller set in Nebraska and 15th novel in the series. SIGNED by the author on the title page. First edition, first printing. New and unread. Dust jacket is enclosed in a clear mylar cover. Book will be carefully packed and shipped in a box. New in new dust jacket. Glued binding. Paper over boards. With dust jacket. 384 p. Jack Reacher Novels. Audience: General/trade. First Edition Stated/First Printing, 2010. Excellent Condition.